You have to wonder at the particular brand of knuckle-headedness that governs cycling. This week, at the Giro d’Italia, there was a positive story to be had. Not the failed drug test kind of positive but a solid gold good news story. Worthy of a Chariots of Fire soundtrack. That good. The scene opens on Aussie cyclist Richie Porte. He’s a serious contender, in third place overall, 22 seconds behind the leader Alberto Contador. He’s done 193 kilometres of the 200-kilometre 10th stage when he gets a puncture. His support car is nowhere to be seen. He’s losing precious time. His entire race could be over. Cue Vangelis. Suddenly Simon Clarke, a fellow Aussie from a rival team, stops. He takes the front wheel off his own bike. And gives it to Porte. This is the best sport in the world. It’s a tremendous act of generosity. Porte is able to take off in hot pursuit of the leaders and finishes the day behind but still within their reach. As the music reaches its crescendo, the Twittersphere lights up with accolades for the heroic Clarke. No one can wreck this story, right? Ordinarily no, but never underestimate the capacity of cycling’s governing body to shoot itself in the foot. In the ultimate mood killer, it slaps Porte and Clarke with a two-minute penalty for breaking the rules. ‘Win’ seven Tours de France doped to the eyeballs? No problem. 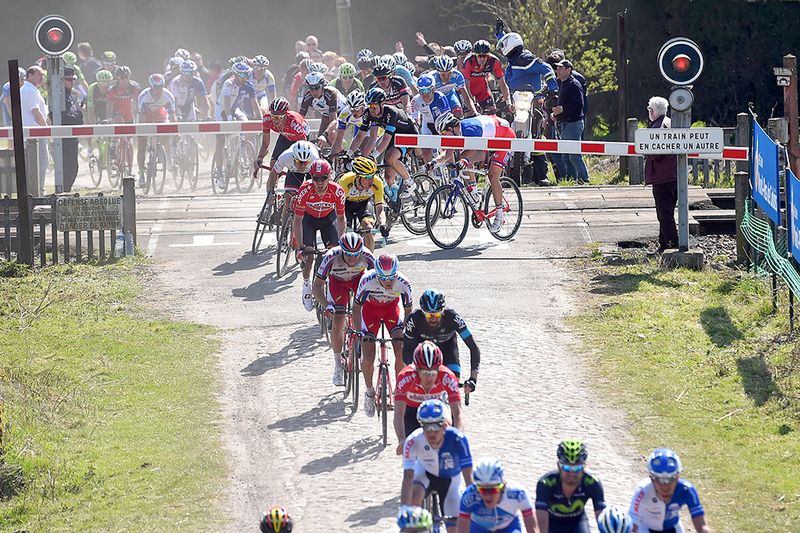 Ignore a safety barrier at a train crossing during the Paris-Roubaix, while a fast train barrels towards the peloton? No problem. An act of sportsmanship? Oh no, we’ll have none of that. 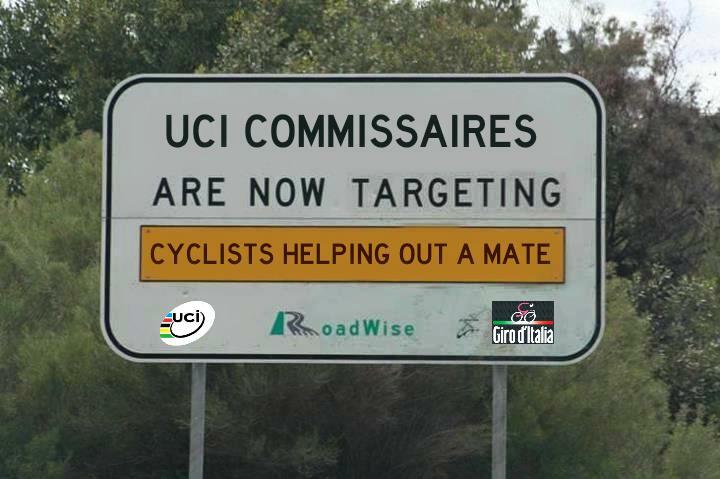 So the UCI gets my vote for numpty of the week. But there are many noteworthy contenders. Like Stuart Broad, who kept English cricket in the news in all the wrong ways when he missed a sponsors function after getting on the turps with a former teammate. “I woke up with a migraine,” claimed Broad’s note from his mum. I’ve never seen ‘hangover’ spelt that way. Also taking a misstep this week, quite literally, was Australian soccer head honcho Frank Lowy, right off the podium during the A-League trophy presentation. And David Gallop might have some explaining to do to his boss for choosing to save the trophy over his chairman. Novak Djokovic has had a bit to celebrate lately. Tournament wins, marriage, fatherhood. So you’d think he’d have half a clue how to open a champagne bottle without sustaining a cork injury to the face. Manchester United defender Phil Jones came up with a brand new move on the football field. I’m calling it the face-plant header. It may not be pretty but points for courage and improvisation. Serial prankster Dan Jarvis gatecrashed the FINA Diving World Series in London with a jump from the 10-metre platform that didn’t score highly with the crowd or the judges. Sloppy form in the air, insufficient technical skill, an obvious bend in both knees, a rookie nose hold and nothing like a rip entry. But there was a reasonable degree of difficulty in getting past security and some measure of artistic interpretation in leaving his house keys at the bottom of the pool. Russian President Vladimir Putin scored eight goals in an ice hockey exhibition match marking 70 years since the end of World War Two. Of course he did. The good news is that the opposing goalie got to keep his life. And finally, hats off to mixed martial artist Ronda Rousey. The undefeated women’s bantamweight champion says she’d like to become the world’s best pound-for-pound fighter, a mantle held by serial domestic abuser Floyd Mayweather. And I reckon she beat him right there. Hi Kaz. Firstly, a definite LOLsy hats off to Ronda Rousey! Secondly, that cycling incident sounds a bit like my husband’s experience in the MS charity ride in Melb a few weeks ago, except that I was his Simon Clarke, and I was tucked up cosily at home on a rainy Sunday when I heard the call … threw the kids in the car, had to get petrol because I was close to empty, drove to a bike shop to buy a new tyre (because after 3 puncture repairs he discovered that he actually had a split tyre) and drove into Yarraville to hand over the tyre, THEN had to go to where he had parked his car in the city and call the RACV because his car had actually broken down before the race. I wasn’t hearing any Chariots of Fire soundtrack though. Gael, that’s gold! Hope your husband shouted you a fine dinner that night. If not, then he owes you one! Some very funny footage here! Nice way to end the week….keep ’em coming. Will do, Kelli. There’s no shortage of material out there!